Myopia - objects at a distance appear blurred and out of focus. During the refractive surgery cornea middle part's tissue is removed and the cornea is made flatter. This reduces eye's optical power, which draws together light rays and the object reflects clearly on the cornea. 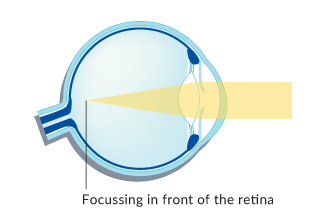 In a near-sighted eye, incoming light rays form an image in front of the retina because the cornea is curved too strongly or the eyeball is too long.